Credit Astronaut photograph STS110-717-17 was taken with a 35 mm film camera and is provided by the Earth Sciences and Image Analysis Laboratory at Johnson Space Center. 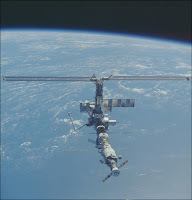 Additional images taken by astronauts and cosmonauts can be viewed at the NASA-JSC Gateway to Astronaut Photography of Earth. From Neil deGrasse Tyson, Department of Astrophysics & Director, Hayden Planetarium at the American Museum of Natural History, comes this little bit of news. "Hayden Associate and intrepid sky watcher Joe Rao" has alerted him that the space shuttle will be visible to people in NY, NJ and CT tonight. All you star-gazers out there, plan to stay out late and avoid Times Square. TONIGHT: TWO FOR THE SHOW! As many of you may be aware, during the past week the Space Shuttle Atlantis has been docked to the International Space Station (ISS). Yesterday, at 10:42 a.m. EDT, Atlantis undocked from the ISS and pulled slowly away. Atlantis will still remain relatively close by to the ISS (within 46 miles) through the remainder of its mission, which is scheduled to come to an end tomorrow afternoon. Periodically, when the ISS (or other, smaller artificial satellites) move across the sky within a couple of hours of sunrise or sunset, they will appear to shine by virtue of reflected sunlight off of their metallic skin or solar panels. This gives the appearence of a "star" moving with a steady speed across the twilight sky. When the ISS makes its scheduled pass over the Tri-State region this evening, however, we'll be getting a view of two space vehicles for the price of one! Instead of the usual view of one large "moving star," we'll be looking at two: the ISS and the Atlantis Shuttle! The ISS will actually appear to "lead" Atlantis across the sky . . . but since it is not as big as the ISS, Atlantis will appear a little smaller in size and brightness. They'll be separated by about 10-degrees -- roughly the width of your clenched fist held at arm's length. So where and when should you look? Get outside this evening by 9:15 p.m. Get your eyes adjusted to the night sky. Then, start concentrating on the northwest part of the sky. Over toward the west you'll see the brilliant planet Venus (unmistakable) and above and to its left, the fainter planet Saturn. Less than an hour earlier, the Sun set will have in the west-northwest. So that's the general area of the sky to look. Atlantis and the ISS will first appear at, or shortly after 9:20 p.m., moving up and toward the right; two bright "stars" moving with a steady speed across the sky. The ISS should appear very bright with a yellowish hue; Atlantis will seem pure white. By 9:22 they'll be reaching their highest point, more than halfway up from the horizon to the overhead point in the north-northeast. Around 9:23 they'll be descending, but should pass close to Vega, a bright bluish-white star. By 9:24 they will have dropped low to the east-southeast horizon, when they'll suddenly fade out . . . as they pass into the Earth's dark shadow. Both space vehicles will be moving along a track from Watertown, NY down to Cape Cod, allowing us to see them from our area. Spread the word and tell your friends and neighbors about this unusual sight.